A typical streaming service provider has some assets which is used by several customers in parallel. Of course, each client needs to see appropriate statistics and the service provider does not want to share data among all users. This is why WMSPanel has a mechanism that could do the right thing for all stakeholders. Media servers use application as its basic instance that might be a mapper for anyone. It provides access to some functionality that is implemented by a customer or some 3rd party. OK, so it's a server and an application, these are the things we need to watch at. All we need is to allow making the links between our customers, their shared resources (servers) and clients (with their applications and users). We defined data slices, or slices of filtered data. Permissions for those subsets of data may be setup not only to individual users but to the group of assigned users. This allows seamlessly share resources statistics to any number of clients. Any server may be assigned to any number of data slices and thus users. Those users will have reports for only those applications which they are allowed to see. Each slice users also have ability to control DVRs and any other streams via MediaCaster cameras stream control. There is a full data slice where all company servers are visible. It collects all the incoming information from all of customer's servers. It cannot be removed or renamed - you can just use it to see overall statistics over your media service. New slice can be created any time. You can either create it from the scratch or just clone the existing one by clicking respective link. First, you need to add servers which will be used to obtain the data. You will choose from the list of existing servers ones. Assigning servers to a slice. 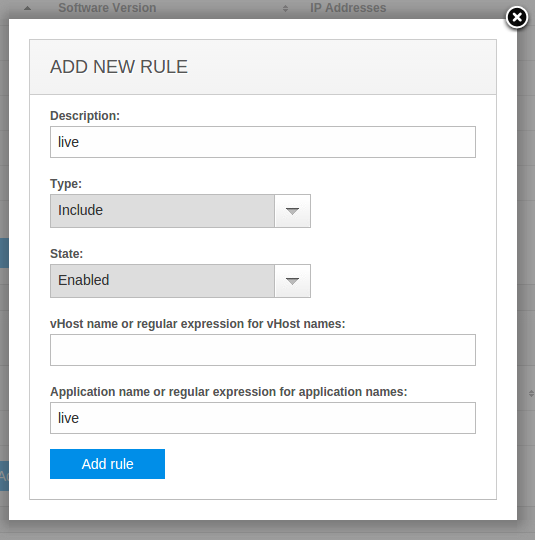 Then a slice needs to have one or several rules which are created to filter out the required data and to determine the "visibility" of applications for slice users. Each rule may have either "Include" or "Exclude" type and it contains a POSIX regular expression that describes the applications to be tracked. So if you have a bunch of apps like "streaming2", "streaming3", "streaming_new" etc. 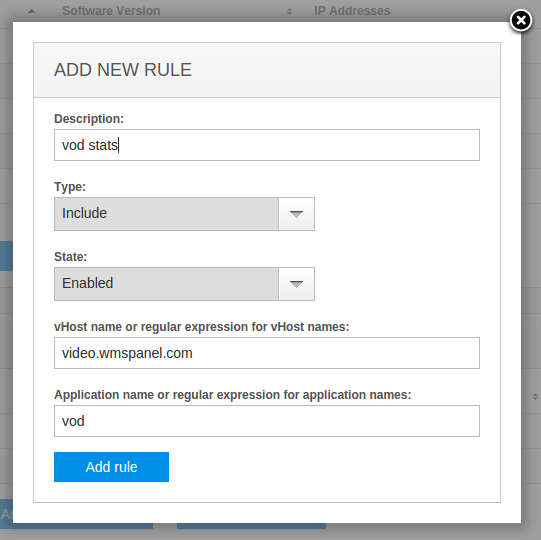 you can set up rule like "streaming". It will match all of the mentioned applications. You can either quickly create a slice by choosing one of existing applications (taken from the servers added in the panel) or by entering all fields manually. List of rules to filter data of a slice. Defining rule for filtering data. In case of Wowza you may also specify exact virtual host to collect data for. For Nimble Streamer you may specify domain name. In both cases you may use regular expressions to describe the match. Specifying domain name for gathering its stats. 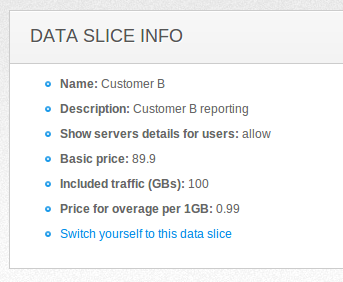 Each data slice may have its users who will be able to see reports for the data taken from sources available for them. Administrator is able to switch between all slices. A non-admin user is able to switch between the slices which he is allowed to see. Learn more about users management and permission set up. Once a slice is created, its rules are added and users are assigned, each of those users may log in and see reports about servers that are currently visible according to the rules mentioned in his slice. All daily-granulated statistics - Daily stats, Geo-location report, ISP networks, Duration metrics and Single day summary - are based on data slices and provide per-slice statistics. Check this screen cast for reporting details. Data slices concept works very well with other capability of our service - "white label" branded panel. You can show statistics to your clients using your own domain name and logo with no mention of WMSPanel. So your clients will log in to your website using credential which you give them. Please read this post about white label panel to learn more. 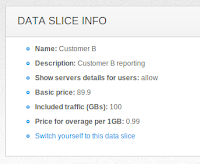 The customer-defined slice may have cost and traffic settings for further usage within Billing feature set, check that blog post for details. If you want to use WMSPanel daily stats as an origin for further processing, like for third party billing, you can use our statistics push API. Data slices concept is part of overall end-user experience of end-users. You may also specify time zone for any slice for convenience of end users who want to see their stats using their own dates and times. If you don't need your slices to have rich functionality and you just want to show daily statistics to your customers then you may want to have "lite slices". They mean reduced functionality for reduced price. For lite slice there is no high-detail retrospective reports for each individual stream. So if you go to "Streams report" for lite slice you will not see links for detailed charts. Also, each lite slice may have only 1 non-admin user. This allows reducing price for lite slice by twice. Lite pricing may be applied starting from 6 slices in customer's account. So you may have 1 full data slice (which is default) and 5 lite slices. The price for this case would be only 55 USD with additional 18 USD in case if you use daily Wowza geo-location stats. To start adding lite prices or convert existing full slices into lite, please contact us so we could enable this feature for you. Feel free to sign up at WMSPanel, download an installer and try looking at your server reports. If you have any questions or suggestions please contact us to get more info. Data slice may be successfully used for both Wowza and Nimble Streamer. To use these stats within your analytic tools, you may use Daily stats API, Duration stats API, Players and devices stats API and Real-time stats API.